I played this game long ago. And I kept reminding myself to do the review for this game but fail to do so. So here it is!!! I do still have memories of this game. And I find it enjoyable. 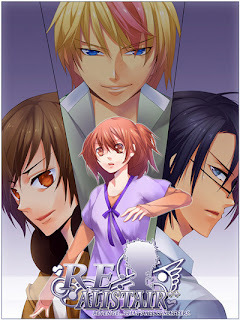 The storyline is rather cool, I love the concept of virtual online game in otome games. Since its actually rather hard to fit in a game in a game. But I find it rather amusing for all the main characters to play the same game. And you should know how big the "online" world is.......so that the contradicting part. But the fact that you need some status to get the guy you want is actually similar to otome games that are more interactive. I'm rather neutral toward all three of them. But I must say the game is good. Good drawing and CGs. Worth playing and trying. I like Shiro the best. How about you?